This tutorial is about making a character-based text generator using a simple two-layer LSTM. It will walk you through the data preparation and the network architecture. TensorFlow implementation is available at this repo. The days are flunch and sure. And we will be well beloved, once well carer. When thou hast kill'd his life? You speak and never need me not. I great him, some little dreadful eye is bleed? The first thing is to process this txt file so it can be useful for training text generator. Notice the examples don't have to be complete sentences. In fact, we should use a fixed length and batch the sentences for fast training. In this blog we use sentences of 50 characters and find the results quite satisfactory. A simple 2-layer LSTM network for Character based text generation. The input character (encoded as a number between 0 - 66) is first embedded as a 256 dimensional vector: it is first converted into a 67 dimensional one-hot vector, then mapped into the 256 dimensional feature space by the projection matrix EmbeddingW. EmbeddingW is randomly initialized and trained jointly with the rest of the network. 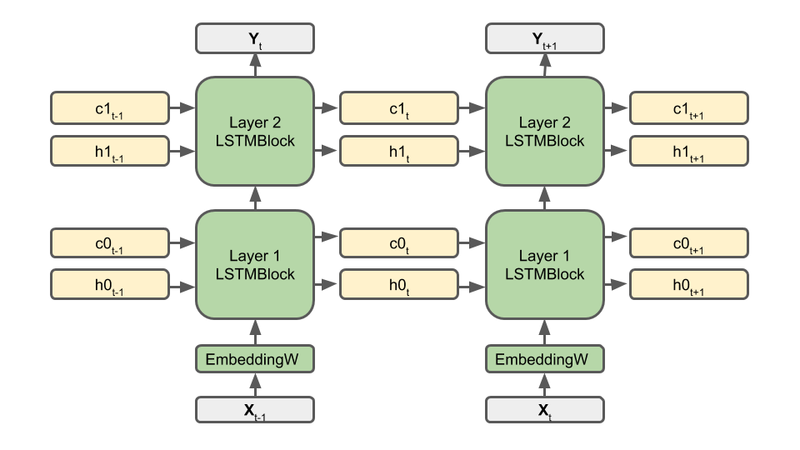 Then come the LSTM layers. Layer 1 takes the embedded input character X and its memory cells (h0 and c0) from the previous steps t-1, then computes the input for Layer 2 and updates its memory cells (h0 and c0) for step t. Similarly, Layer 2 produces the output prediction Y and update its own memory cells ( h1 and c1) for the next step. During training, the input X is a character in the source sentence, while the ground truth for prediction Y is the paired character in the target sentence. During testing, the networks takes an random character in the first step, and uses the predicted character as the input for the next step. All memory cells (h0 , c0, h1 and c1) are initialized to zero at the beginning of the training and testing. We use cross entropy as the loss to train the network. In essence the network looks at each time step and penalize the prediction what does not match the ground truth character in the target sentence. During testing, The output prediction Y goes through a softmax function, which generates a probability distribution over all 67 characters. The final prediction will be sampled from this probability distribution. One can use a "temperature" hyper-parameter to control the behavior of the generation: low temperature will concentrate the probability around the likely characters, so the generated phrases might be restricted to a limited context or even self-repeat; high temperature, in contrast, will soften the probability distribution so the results are more diverse but prone to artifacts such as misspelling. honestess that in his likeness. The sea of the world is not the sun of the world. gods, I'll yen,-upon sea-bluence cowards twice. Old Grew, if thou mushleed, farefal, nothing from all. You can download the demo from this repo.